This guide contains more than 100 how-to articles to help you learn how to advocate for the preservation of historic buildings and resources in your community. 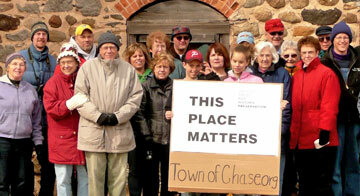 Contact Joe DeRose by phone at 608-264-6512 or by email below for questions about Historic Preservation Advocacy. Learn how to organize support to save historic resources and promote preservation policies in your community. Learn fundraising skills and strategies and discover where to find financial support for your historic preservation organization. Learn how to build an effective nonprofit board of directors, find and keep members, solve common nonprofit management problems, and work with government on historic preservation issues. With resourcefulness and ingenuity, Wisconsin’s historic preservationists have raised millions of dollars to protect the state's historic past. The Historic Preservation Advocacy Guide is supported in part by a Preserve America grant administered by the National Park Service, Department of Interior.